There are many retired British ex-pats in Thailand, and with the cost of living and the dreadful climate in the UK (summer fell on a Tuesday last year), do you blame them for seeking a warmer retreat for their dotage? But is everyone over the age of 65 really dottled? Simple answer, No! But those of you over 65 will have found that the younger generation tries to push you into that retired person’s home category. Here we are - waiting to die! Here is an example, a few years ago, my eldest son (then 29 years old and a strapping 6’6”) and I went to the UK to visit my dear old Mum and my sister. While there we decided that father and son might like to go and explore the nightlife in the fairly large city close to my sister’s rural retreat. Upon asking where we should go in town for some drinks and dancing, I was told by my junior sibling, “Oh there’s nothing for you there!” “What do you mean?” I replied. “You’re too old!” was the answer. Resisting an immediate urge to give her a clip behind the ear for insolence I said, “But what about him?” pointing to 6’6” of youth and enthusiasm. “Oh he’s too old too,” was the response! What a sad indictment of today’s world! At 29 years of age, this young fellow was considered to be too old to go out and enjoy himself? Of course, for me at age 60+, it was practically sinful to even contemplate it! There is an unfortunate tendency in the western world to write everyone off after the age of 25 it seems, you don’t have to wait till you are 65 to be redundant. But why should this be? The only real difference between “old” people and “young” people is that the older group have much greater experience. There is precious little of substance worth doing that older people cannot do. And I am not talking here about people over the magic (and arbitrary) 65 year retiral age. I am talking about anyone still wandering around the planet unaided, no matter how old they are. For example, if you are 80 years old and want to do a parachute jump, can anyone tell me why not? The reason I say this, is that by the time a person is 80 years old, they have a fair idea of what they can or cannot do. After all, they’ve had that same body for eight decades, they must know it pretty well by now. The problems you come up against when deciding to do something is not usually a “physical” restraint, but a mental one. You get conditioned by the western society that you are ‘over the hill’ and you must sit in the corner and quietly rot away. Well, that’s exactly what will happen to you if you do sit quietly in the corner! Like any living creature, you need stimulation (and I’m not talking about the ‘stimulation for hire’ bars), and mental stimulation will get you going physically as well. Forget about your chronological age and think about things that you want to do - and then work out how you are going to do these things. Obviously, if you are 80 years of age and you tell me that you want to run a mile in four minutes, this is not only impossible, but it is silly! However, if you tell me you want to take up running and want to train for the marathon, I will say, “Go ahead!” I might suggest starting off with shorter distances and work on from there, but the concept is the same - if you want to do something - go ahead and do it. Do not accept “age” as a barrier to anything. Work out how to do it and get on with it. Live life to the fullest, every day, for as many days as you have got left! And there is nobody on this earth can tell you how long that will be, not even Gypsy Petulengro. It amuses me when I read some of the letters that men send to you complaining about how the bar girls that move in with them seem to always want more money. You live with a bar girl until you are ready to move on or tired of being an ATM. You guys have it easy. I have been married to a Thai woman for 8 years. When I met her she worked in a hospital, I guess you would call her a non-bar girl. Here’s my point; I have spent much more money since being married than I ever did when I had bar girl friends. When you marry a Thai girl, you also marry the entire family. My wife has six sisters, all married with kids. They never ask me for money, however, when I see that one of the them is having a hard paying off the bank loan because the rice crop was flooded out, a nephew or niece needs money for school, a brother-in-law is laid up in the hospital because one of his bulls kicked him, or another bother-in-law drives around in an old rusted out Mazda P/U while I drive a New Nissan P/U and our house is paid for, I help them. Do you think I turn my back on them and “move on”? The eight years I’ve been married to my Thai wife are the best years of my life and I hope for many more. Although I respect and admire the bar girls - theirs is not an easy life, they are just trying to survive - I will never go back to that kind of life. Why didn’t you wait for me? I am having a hard time paying off a bank loan (tried to buy 50 kg of rice the other day and it was more than my salary, so I approached the bank for a food mortgage), and I have a rusty old bicycle as I can’t afford a pick-up (but I avoid bulls at all costs). You have also correctly described the Thai families (that you marry into) - they are not (despite claims to the contrary) all standing in line with their hands out. They are ordinary people, who look after each other when needed. You sound like such a nice man, my Petal, I shall cry myself to sleep tonight having missed you. However, I am so happy to hear you are enjoying the “best years of my life”, and yet do understand the plight of the bar girls. Or rather, the trade of the bar girls, as they are not forced into working from around a chrome pole - they choose that existence. “Plight” is how they promote it, looking for (several) kind hearted gentlemen (ATM’s) to give them their pin numbers and fantastic plastics. Stay well, Uncle Bill. Macro photography - should you try it? Have you looked at the icons on the top of your newly acquired digital camera? Does it have a thing that looks like a tulip? If so, you are on your way to macro photography. The simple name for macro photography is ‘close-up’ photography and allows you to get much more detailed images of subject matters that are very small. Obviously one does not need macro facility to photograph an elephant, but to get the elephant’s eye and nothing else, a macro capability in your camera would make life easier (even if not for the elephant). There are many pitfalls in macro photography, and some are financial. If you want a car that does 200 kph, it is easier to start with a Porsche than it is to start with a Corolla and then modify the engine. However, the Porsche is a lot more expensive. Likewise, true macro lenses are more expensive than ordinary ones modified to have macro capabilities. Having said all that, it is still possible to get close-up photographs with some fairly simple equipment, with the easiest being called ‘close-up lenses’ that screw on to the front of your existing lens. These usually have numbers like +1, +2, +4. The +number refers to the diopter measurement of the lens and the higher the number, the greater the magnification possible. The dioptre measurement is the reciprocal of the focal length of the lens measured in meters. Therefore a +1 diopter lens is 1 meter focal length, a +2 is 500 mm and a +4 is 250mm. These add-on lenses are available in a variety of filter sizes and qualities. If you don’t wish to get heavily involved then a set of uncoated close-up lenses to fit your favorite lens is the way to go. Coated close-up lenses cost more and will yield a better image, and two element close-up lenses (much more expensive) will give better results but you need to be a dedicated macro man. The effect of these close-up lenses increases as you add them together. The +1 and the +2 screwed together will yield +3. However you come across another problem when you start ganging them up - the focal length gets smaller and the light that gets into the camera becomes less. Understand that in all macro photography as the lens gets closer to the subject and the image gets larger on the film, the light reaching the film is lessened. Also the depth of field gets very shallow and to combat this, very small apertures are called for which lessens the light to the film even more. Both these things in combination mean that normal hand held exposures are usually out of the question. A tripod is needed for steadiness plus flash is needed in nearly every circumstance to give decent illumination. However, as you strive to get closer to the subject, there may not be enough distance to get the flash to light the subject. A ring flash can help here, but that is another expense. There is another way around this and that is to use a light box. Now these can be purchased from specialized camera suppliers and do cost money, but you can make your own light box very inexpensively. The secret is a large cardboard box and some tracing paper, but go to this website and it is all explained http://www. strobist.blogspot.com/2006/07/how-to-diy-10-macro-photo-studio.html. So there you have it. If you have a macro lens in the camera, then experiment with how close you can get to your subject. If you haven’t, then try screwing the close-up lens on the front. I find the +3 the best for my camera gear. The biggest problems are short depth of field and lighting; however, none of these are insurmountable. Try it today, after you have built the light box! Perennial optimist Sam Liddle, multi-award winning manager (2004-6 Lipper Best Risk-Adjusted UK Aggressive Mixed Asset Manager/Standard & Poors #1 ranked Global Neutral Portfolio Manager) delivered an upbeat message to MBMG clients last month. “Global population has increased 2.6 times since 1950 and is still rising fast. Developed countries accounted for 1/3 of the then population (2.5bn). By 2005, they accounted for less than 1/4 of a 6.5bn population. The UN predicts that by 2050 there will 9bn on Earth, more than 85% of whom will live in emerging markets. Sam re-iterated the belief that active, adaptive, impartial asset allocation is the key to MitonOptimal’s consistent outperformance and their expectation to continue doing so. MBMG’s iconic lead portfolio manager, Scott Campbell, will be visiting Bangkok from June 4 - 6. Contact Todd Guest at MBMG International’s Client Service Desk on 02 655-6044 or email [email protected] to hear the world’s leading global portfolio manager (S&P #1 ranked performing Global Impartial/Active Portfolio Manager) give his big picture view of the global economy, world markets and investment opportunities at our public seminar or in a strictly limited number of one:one meetings. The above information is issued for general guidance and is not a solicitation or investment recommendation. Historic data is no guarantee of future performance and the value of some investments can fall as well as rise. In a small rural area, there once lived a harsh land owner, who battered his wife, beat his children and did not let them go to school or even feed them well. He was similarly cruel to those who worked for him. Outside, people saw this and, mainly behind closed doors, criticised him and felt sorry for those he ill-treated. The problem was some quite powerful people relied on what he produced to help them get richer and even subjugate some of their own workers and others who were not their workers but whom they also wanted to control. Despite being the richest and biggest landowners in the region, they still wanted even more land and subjects. In short, nothing was done for the battered wife and her kids and even when the workers tried to go on strike, nothing happened because the cruel land owner brought in some paid thugs who beat up the workers and put those who were still able back to work. Then one day, a very violent storm struck the land owner’s property and caused enormous damage, killing many of his workers and destroying much - but not all - of his land and crops. His home was devastated but he boarded it up and kept the children and his poor wife indoors, as they had been kept for years on end. At last, people from all around became even more concerned and finally decided to help the victims, offering to bring food and medical help to the family and try to explain the situation to the increasingly insane land owner, who seemed to be in a world of his own. At first, he refused to listen, then agreed to accept some medicine and water and food but said, “leave it outside and I’ll feed my hostages and look after their wounds myself”. People hesitated to do this, but, feeling sorry, they rightly and naturally did so for days on end but became increasingly worried about the captives. The other landowners, who were still only concerned with the supplies they got from other non-devastated areas, said, “don’t do anything rash”. And people from the churches got on their knees and prayed for divine intervention which naturally never came and they said, “well, that’s God’s will and nothing can be done”. Some people and a couple of French and American landowners said, “we can’t leave those people indefinitely. We don’t even know whether they are getting any of the food. We aren’t even allowed to check whether they need real medical help”. They wanted to knock the door down and take the food directly into the house and eventually rebuild the house and hoped one day to free that poor woman and those ill-treated children. But they got little support from the others around them and there was much gnashing of teeth and wailing and cries of despair until, at last, action was taken. But, of course, it was too late and when they finally went in, they found most of the people dead or dying, never having been given the help they needed. The house was in even worse condition than they feared and took ages to rebuild and the surrounding land had not been maintained at all but simply exploited and that too took years to recover. And that is how the old saying “a stitch in time saves nine” came into being. But apparently, they never translated that old saying very widely, let alone in Burma. Meanwhile, in the “real” world, the Life in Chiang Mai has decided to open up half of its column to students from local colleges and schools in Chiang Mai. For the next few weeks, we will be publishing students’ short essays on aspects of life in the City. Here is the first, sent to us by Purity Kwalar, a 20 year old student at Payap University. “It has been three years and a half since I arrived at Chiang Mai as a university student. I have been enjoying my studies here, and especially having fun with school and friends. However, for all these years, I guess my daily routine has never changed. At six in the morning, my alarm clock would start ringing, “Te-te-te-te-te.” I would then get up lazily from my messy bed and sit down on it for awhile. I would open the curtains above my bed and there - the big bright yellow sun would rise up from behind the great mountains. For someone like me, who has been so much in love with mountains, it was just the best scenery ever seen. As the place where I live is a bit far from the downtown area, there are not many motorbikes and cars rushing on the streets in the mornings. I like to look out to the streets and gaze at some people who were on their way back from exercising on the university campus. After spending my time with the morning light, I would wash up and dress up my white shirt with its distinctive school buttons, and a short black skirt with the school belt. I would always feel that I looked just perfect with my school uniform. Then, I would walk down from my school’s apartment and make my way to school. On my way there, my Thai friends would greet me “Sawadee kha” or “Sawadee khrup” with sweet smiles on their faces as we bumped into each other. This would always make me feel warm inside; it promised me that I would have another good day at school. Although school lessons would stretch for the whole day, they never made me feel exhausted, for the teachers knew how to teach the students in an effective and interesting way. I would spend my entire day at school being with my international friends and teachers. As usual, there would be a small talk over lunch with my friends. This was my way of relaxing, by having fun time and joking all around. Towards the end of the day, as the clock turns five, my last class would end. I would walk back to my small lovely room and take a long shower. At around six o’clock, my friends and I would then gather to have a delicious dinner together. We never fail to order Tom-Yum-Goong, Pak-Poom-Kai, and Ka-Pao-Mu, for these dishes are our favorites. Sometimes, after finishing a pile of dishes, we would still order Kao-Plao, and the shopkeepers would often be surprised by our good appetites. As the night time comes, we often take a walk to the university to get some good fresh air while sharing our own stories at the same time. Sometimes, we comfort each other, fight over little things, and laugh together. Being together all the way through the university life binds our friendship stronger and stronger day by day. When it comes time to study, we return to each of our rooms, and take time to study. Before the clock turns to midnight, I would already be in bed looking forward to the next day to see my friends. Then, I would wonder inside and thank Chiang Mai where I met my wonderful friends - friends forever”. Juno: US Comedy - This film will completely win you over, I guarantee it! It’s the brightest and funniest comedy to come along in a long time. Juno discovers she’s pregnant, and is forced to grow up fast. The dialogue is absolutely unique, from a person with a refreshing point of view on life. The screenplay won the Oscar. Reviews: Universal acclaim. Penelope: UK/US Comedy/Drama/Fantasy - This modern fairy tale begins with a generations-old curse by a jilted lover: the next girl in the aristocratic Wilhern family will be born with a pig’s snout and ears. The film depends wholly on the charm of Christina Ricci, James McAvoy, and Catherine O’Hara (as the mother); if you enjoy them, you may well enjoy this slightest of fables. I’m afraid their charm eludes me. Mixed or average reviews. Memory: Thai Horror/Mystery - A much anticipated film starring Thai superstar Ananda Everingham. Here he plays a psychiatrist faced with deciphering the causes of the fear and anxiety he sees in a girl of seven. Though advertised as having English subtitles there are none, nor are there plans for them. A real pity. Speed Racer: US Action/Drama - Basically a family film based on the classic anime series created by anime pioneer Tatsuo Yoshida, about a boy who was born to race cars, filmed almost entirely in front of a green screen, with the backgrounds and foregrounds added later. The film is brimming with superb special effects that are technically inventive and seductively surreal, with a sweet plot, and some thrilling races. John Goodman and Susan Sarandon play the parents, and Korean Heartthrob “Rain” plays a competing driver. Generally negative reviews. But I think it is a milestone of a motion picture, extraordinary in the details of its universe. Yes, I think it’s some kind of great innovation of a film, but that doesn’t mean it’s comfortable viewing. Most critics and most viewers have found it intolerably irritating, but then I think that the very things that make a work great are initially irritating – the world just slowly gets used to them over time. The Wachowski brothers had complete control over this movie. They wrote it and directed it, and had final say in everything. It’s completely their vision. What did they set out to do? 1. Make a family movie. They did; it’s PG rated, with no swearing, no fart jokes. We’re shown a 60’s US family in a supersaturated suburban home which is heartwarming, and hilarious in its meticulous details; like a sitcom come to vibrant-hued life. 2. Faithfully recreate the original 60’s anime series and subsequent comic books and TV series (both Japanese and US), which ran for years. They have been huge fans of “Speed Racer” in all of its forms since they were kids. Though being faithful limited them as to what they could do, they did it: The characters look and act exactly like their anime counterparts. 3. Present it all with innovative filmmaking techniques and new-era visuals. They certainly did. The movie is chock full of sights never before seen on screen, which will require several viewings to begin to appreciate. What Happens in Vegas…: US Comedy/Romance - Cameron Diaz and Ashton Kutcher star as strangers who unwittingly end up as bride and groom after a wild night in Las Vegas. After they sober up and agree to get an annulment, things get messy when they win a $3 million jackpot, and argue about whose it is. The story is about very sophisticated, very verbal rich people, whose characters are distasteful and basically cruel. I feel rather ashamed that Thais are watching this as an example of how things are done in Western culture. Generally negative reviews. Iron Man: US Action/Adventure - Superb popular entertainment. A huge hit in the US and around the world, not only with the public, but with the critics and reviewers as well. Indeed, I think they got everything right in this movie for once, and I’m sure you’ll like it very much. Generally favorable reviews. Phobia/See-prang: Thai Horror - Four quite good horror stories by four Thai directors. Quite well done. The “In the Middle” segment is about the four young guys out camping, and bedded down for the night telling ghost stories, and I like it very much. I thought the interactions of the four boys throughout were natural and fun. I also liked the fourth story, “Last Fright,” about a very self-controlled flight attendant and her interactions with a Middle Eastern princess, both alive and dead, on her specially chartered flights. The attendant loses it all to madness as she is ultimately left alone in the airplane with a corpse. Much dialogue in English. Indiana Jones: The Kingdom of the Crystal Skull: US Adventure/Action - The one you’ve been waiting for! Indy is back, older and wiser. Buy! Buy! Bye bye, Pai! About 135 kilometers northwest of Chiang Mai, the town of Pai is home to about 3,000 citizens, 6,000 guest houses, 9,000 internet shops and a plethora of fluorescent pink, yellow, green and blue bank branch offices and ATM machines blazing throughout the night on charming streets formerly lit with tiny bulbs and dull street lights. Five years ago no stoplights or 7/11s tarnished the culture of the village and you could feel a relaxed pace on Main Street in the late afternoon, lined with small market stalls and hill tribe folks selling produce on blankets. Today there are two stoplights, two 7/11s, several luxury resorts and the local street vendors have been banished to an area by a spanking new municipal building, far from their former customers. 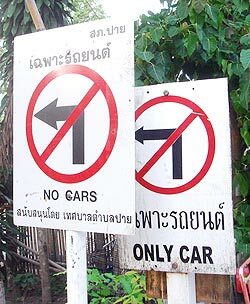 English and Thai don’t match in Pai: the front sign says “No Cars” in English and “Only Cars” in Thai. Pai is actually “misspelled” in English: it contains no “p” sound; it starts with the same Thai “b” consonant as “bai”, (but has a longer vowel), as in the standard greeting from tuk-tuk drivers wanting your baht: “Bai nai?”, (Where are you going?). Its English translation would be more accurately spelled “Buy” or “Bye”, but they’re not particularly inviting names for a town. Merchants’ “punny” names like “Pai in the Sky” or “The Peace of Pai” should really be what they are evolving into: “Buy in the Sky”, or “The Peace of Bye”, which is what I felt the last time I left. Rich folks from afar have bought up the land in and near Pai, some constructing upscale lodging on the main street that now sit vacant during the slow season. A road once full of little shops now resembles a dying downtown in America where locals have fled to the suburbs, though in Pai, it appears they were pushed out. The Land of Smiles used to be easy to find in Pai, but now you slog through the Bog of Bored Counter Help. I’ve been trying my hardest to patronize the local bakery/convenience store close to the 7/11, even after my last encounter with the snarly cashier when presented with a 400 baht bill for a couple of waters, toilet paper and a snack. Instead of the 20 baht water, I had accidentally picked up two bottles of Evian - naïve spelled backwards - priced at 165 baht each. She steamed as she redid the bill. This trip, in Thai, I politely asked for a receipt. She glared and said, “No.” Assuming I hadn’t said it correctly, I asked again. She yelled, “No check!! Machine broke! !” or “Just give me your money and get out! I hate you and my job!” I will never enter her personal hell again. The rudeness of the tourist herds they have snared does not inspire friendly behavior in return. While waiting for change during check in, four swarthy creatures that spoke a native language containing no vowels whatsoever, barged in front of me, no excuse me, no please, no greeting and hurled demolished English across the counter: “We want air-condition room and fan room, now,” etcetera, speaking louder and faster when misunderstood by their chosen Thai slave. Gentle, polite Scott suddenly became invisible as the cretins took over. I wanted to say many, many bad words to them and stick their backpacks up their backholes, but I just watched quietly, feeling rather embarrassed to be of a similar white race. I keep hoping it will regress to days gone “Pai”, but as I experience Pai succumb to commerce, I’m reminded of when my mother died of cancer. Every week she’d get worse, but after each daily hospital visit, I’d leave and heal her in my mind. I’d go back the next day with optimism, hope and cheer, only to see she’d slipped further away. Yes, many sweet people live in Pai. Yes, you can still find a piece of peace in Pai without feeling like a cow pie. Yes, the motorcycle ride on the new road to Pai is stunning, an absolute joy, but as the saying goes, “Live for the journey, not the destination.” Next time I may just stop at the 7/11, where they always greet me with a smile and a sawatdee, buy my 10-baht water, turn around and ride home. Hello and welcome to the latest Doc English column! This week we go all techie, once again looking at ways to improve English online. If your children have native English language speaking children to play with, then they will be very motivated to learn English. It may be hard to find them English speaking friends who share their interests and who are equally interested in learning from them! Your child may have aspirations to one day visit a foreign country and use their English language. Learning about Western cultures is equally as important as learning the English language itself. By chatting with Western (or other English speaking) students from around the world, your child will find out the real purpose behind learning English - not to pass exams, but to communicate with others and learn about new countries, cultures and beliefs. A way to find opportunities for language and cultural exchange could be waiting for you online. These days we have to be careful about protecting who our children come into contact with on the internet, so first you will need to set up the ability to monitor your child’s email and internet access. You will need to be able to filter out spam and other inappropriate messages. You might wish to install Net Nanny (http://www.netnanny .com/) or one of the many software applications that allow you to easily monitor your child’s activities on the internet. You may also wish to regularly check your child’s email account so as to filter out inappropriate email. ZooBuh (http://www.zoobuh .com/) is a great web site that gives you the ability to control and monitor their children’s activities from anywhere. You can monitor email that they send and receive, filter swear words, any other nastiness. ZooBuh can also help your child learn how to use a computer, learn how to type, improve spelling and communication skills and help you restrict what they can view on the net. ZooBuh is fairly cheap and has a 1 month free trial to get you started. Epals (http://www.epals .com/) offers a similar package and is particularly useful for teachers as it allows you to get in touch with teachers and schools around the world. After posting my school on the Net, I got loads of replies from teachers in schools, eager to learn about Thai culture, share English, work on collaborative classroom projects and have fun online! I found the other teachers on Epals very enthusiastic about partnering with Thai Schools. Teachers looking for whole classes to exchange with should also check out Students of the World (http://www.studentsoftheworld.info), which contains a large searchable database of schools and students. Circle of Friends is a site for girls only, with bad word and personal information filters (http://members. agirlsworld.com). It is difficult for you to personally monitor the message content, however. For adults, try English Baby! (http://www.englishbaby.com). English Baby is a great site for meeting friends and swapping English. English Town (www.englishtown.com) is also pretty good. Everyone I’ve met on it has been really friendly. If you speak English fluently already, why not join these sites and help others learn English? You can find out how people live in another country and carry out a cultural exchange. Get the latest gossip from another country! That’s all for this week ladies and gentlemen. If you have any links you’d like published, please email them to me. If you want an independent school review, please email me at: [email protected] com and I will pay them a visit. Enjoy spending time with your kids. The report below is from an aid worker who is at present on the ground in the worst-hit areas of the Irrawaddy Delta, where almost no aid or assistance is being received. He is known personally to Father David, and, for obvious reasons, he prefers to remain anonymous. This week, the Welcome to Chiang Mai page is taken over by a report on Chiang Mai citizens’ efforts to aid the victims of Cyclone Nargis. The adjacent anonymous report is from an aid worker well known to Father David of the Seven Fountains Spirituality Centre, and who is inside Myanmar in the area of the Irrawaddy Delta. His observations are chilling. As the Myanmar military junta trumpets its lies in the state controlled media, saying that “it has the situation under control with emergency plans completed and rebuilding started”, all roads to the Irrawaddy Delta are blocked by army checkpoints and the few foreign aid workers who have been allowed in are confined to Rangoon. In the Delta itself, as the first reports of a disease outbreak in Bogalay come in, the banks of the Irrawaddy are lined with white, swollen corpses and the smell of rotting flesh hangs in the air. Here in Chiang Mai, a mere 150 kilometres from the Myanmar border, churches, residents from all nationalities, students, small groups and individuals, all appalled by the junta’s deliberate lack of response, are working round the clock to gather aid and ensure that, somehow, it gets to those whose lives depend on it. Jackie Pollock, a representative of the Map Foundation, which provides support to victims of the ethnic war in Myanmar, said that cash, medicines and other donations have been coming in from the city’s Burmese community, from Bangkok and from other areas in Thailand. Those who wish to donate can do so at Wat Ku Tao, located behind the Chiang Mai Municipality offices. This appeal from Father David of the Seven Fountains Spirituality Centre was received Tuesday by the Chiang Mai Mail. “Thank you for the opportunity to let the wider Chiang Mai community know what the Seven Fountains Spirituality Centre is doing, in its own small way, to assist the suffering of the victims of Cyclone Nargis Very simply, our retreatants and regular worshippers wanted to make donations. I have a personal friend who is experienced in dealing with emergency situations; he is already involved inside Burma guiding and assisting local Burmese volunteers. He, with his volunteers, has been able to reach previously inaccessible areas. In some instances, the group has been the first to arrive in areas of devastation. This is where donations to Seven Fountains will be sent, directly into the hands of someone trustworthy, qualified, and already in place. Already there are several avenues open for Chiang Mai residents who want to make donations. Should you wish to donate through Seven Fountains, our account is as follows: Siam City Bank, 5 Thapae Road, Chiang Mai, a/c number 300-2-16319-5, swift code SITYTHBK, in the name of Miguel Garaizabal. Fr. Miguel is a well-known long-term resident in Chiang Mai and Director of the Seven Fountains Spirituality Centre. If you are planning to donate, please contact either myself ([email protected] gmail.com) or Fr. Miguel ([email protected]) by e-mail and tell us that a donation has been made for “The Burmese Victims of Nargis”. A young Canadian couple on a loosely planned world-wide journey undertaken to broaden their “North American restricted horizons “ by tapping into humanitarian projects globally, arrived in Chiang Mai before the disaster struck. In their own words, “We are just two Canadians who happened to be close to the tragedy as it unfolded. Our project to do a little good just got big and we’re hanging on for our lives, managing each opportunity and crisis as it comes”. “Big” now involves a webpage at http://freedom30.blogspot .com/search/label/Thailand, a Chiang Mai Rotary Club as well as one in Canada and also the UK Rotary inspired Shelterbox Trust’s aid programme, a registered UK charity, which distributes the Shelterbox to local aid workers at the scene of disasters, in partnership with other aid agencies and through the International Rotary network. This remarkable package is a basic survival kit, containing a 10 person tent made to a unique design, insulated groundsheets, a multi-fuel stove, cooking equipment, tools, mosquito nets, water containers, etc, all designed to enable a family of up to 10 people to survive for at least six months. Exact contents depend on local conditions. A Shelterbox team is now on the ground in Myanmar, working to make sure that aid gets directly to the people who need it most. The couple have also been in contact with the Royal Thai Air Force, who are at present trying to get landing permission from the Myanmar authorities, and the Thai Red Cross, which is one of the few organizations making direct distributions. Local Rotarians are providing much-needed help, aid and support. The Canadian Embassy, it seems, are not; they have informed the couple that purchasing supplies and sending them to the disaster areas would contravene the Canadian Government’s anti-junta embargo. Unbelievable. Donations may be made through the internet at www.shelterbox.org. Christians Concerned for Burma request our prayers, donations and compassion for those suffering in Myanmar and state that there is an immediate need for drinking water, sanitation, food, shelter, blankets, cooking implements, medical care, logistical support and communications, as the military regime is actively obstructing relief efforts. Two of their partner organizations, the Free Burma Rangers, and Partners Relief and Development, are providing relief and assistance through local networks in the affected areas. Please visit their websites at www. partnersworld.org and www. freeburmarangers.org to donate or offer your services. This article is dedicated to a very special friend, a Doi Saket-based Scot named Collum, (or something like that! ), who was so enamoured of this tree that he ordered, from a Bangkok nursery, one baby tree for each of his friends, and managed to persuade a small female relative to drag them, suitably packaged, onto the bus and all the way up to Chiang Mai for distribution! As this good man has many friends, all of whom, (including myself), now have a Cannonball tree growing in their gardens, I feel honour bound to record, for history’s sake, the fact that he is single-handedly responsible for this invasion of Cannonball trees which will, in the long distant future, put Chiang Mai on the map for harbouring so many examples of this remarkable species! Couroupita guianensis, to give the tree its correct name, has flowers typical of the family Lecythidacaea, with 6 petals, red on the inside, and a disc of over 200 stamens, many of which are devoid of energy-rich pollen and merely serve as a comb to transfer economically and efficiently as much pollen as the tree can spare onto the fur of bats. The bats visit the tree at night, lured by the tree’s nocturnal scent, which is deliciously pungent. During the daytime, Xylocarpa bees serve the same purpose. 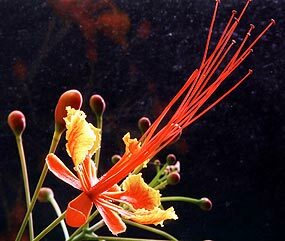 The flowers are conveniently produced on the lower trunk of the tree, directly on long tangled rope-like stems, which can be easily inspected at eye level by humans, and which are followed by rusty brown coloured spherical fruit slightly smaller than a human head. The fruits look exactly like cannonballs, and even give loud reports as they clash together in the wind. They take a year to mature; when they drop to the ground it looks for all the world as though an artillery unit has bivouacked under the tree! Eventually, they decay, giving off a “cheesy” smell, proving that trees knew long before we did what rodents like to eat! The decay reveals about 300 seeds, each encased in a green pulp which turns purple when exposed to the air. Fresh seed germinates freely, and is the best way to propagate the tree, which will eventually grow to an average of 100 feet in height, with attractive whorled glossy green leaves. If you do have room for this massive tree, you should plant it, but please remember, in areas like Chiang Mai, with its prolonged dry season, it will shed all its leaves and can prove messy as a result. If you would like to see the full-grown version, there is a fine specimen in the grounds of Doi Saket Temple, and also a very fine jackfruit tree, whose wood chips used to provide monks with the saffron yellow dye to colour their robes. Jackfruit is rich in pectin - ideal for helping you set your home-made strawberry jam!